Cookies are a controversial part of the Web. These tiny files sit on our computers tracking what sites we visit – mostly to build up a picture of our tastes in order to serve us relevant advertising. While they’re an essential part of ensuring publishers stay in business (targeted ads pay higher rates, dontcha know? ), it’s understandable that you’d want to at least know who’s tracking you. 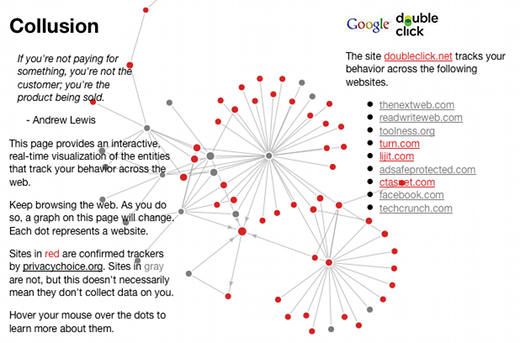 Collusion is a great Firefox extension that maps out the cookies used by each website you visit. Keep it open in one browser window and visit a view sites in another and you’ll see new nodes pop out on the visualisation as new cookies are discovered. Ones marked in red are confirmed trackers. It’s important to note that some trackers are simply there to remember your login details or website settings, and even those that do track your behaviour are probably doing nothing more than helping to serve you up relevant ads. Still, it’s better to be informed than live in ignorance of what those cookies on your computer are doing, and Collusion does a great job of explaining it in a straightforward and easy-to-understand way. While only currently available for Firefox, it’s open source so hopefully it will be ported to other browsers in the future.